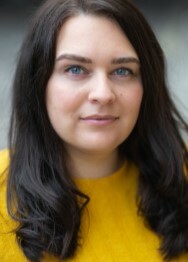 Emily Fairweather is an actress and screenwriter from the North East of England. She graduated from Northumbria University with a BA Hons degree in Media Production and went on to complete her classical acting training at Drama Studio London. Emily has acted for both stage and screen, including guest roles in BBC’s ‘Doctor’s’ and has made semi-regular appearances in ITV’s ‘Emmerdale’ and ‘Coronation Street’, as well as roles in a number of short films and theatre productions in both the North East and in London. She has been writing for TV and Film for almost three years and her first short film ‘108 Hours Missing’ was screened at the 2016 Cannes Film Festival, as part of their Short Film Corner. She currently has a 6 x 60 TV Comedy Drama, ‘Serial Kleaners’ and a short film ‘Nan’, in development for 2019. She enjoys creating funny and flawed female characters, dark comedies and stories with a fantasy or hyper-realistic twist to them.